If you are a reading this page, then you are likely wondering what a septic tank system is, and why you would need one. Or perhaps you are looking to buy and are researching options. This article aims to explore and answer all these questions in a succinct manner. Why are Septic Tank Systems Required? You will need a septic tank system for your property where there is no connection to main sewage pipes provided by the local council or a private sewage company. Sometimes, people prefer to be self-sufficient not simply in providing for their own water use, but also their wastewater. A septic tank system allows a property to become largely self-sufficient in managing sewage. How Do Septic Tank Systems Work? Septic tank systems are small-scale sewage storage and treatment systems often comprised of two or more chambers. Wastewater enters the first chamber of the tank, allowing solids to settle and scum to float. The settled solids are reduced through a lack of oxygen that produces anaerobic bacteria which digests the solid waste. The liquid waste flows through a dividing wall into the second chamber, where further settlement happens. Liquid in the second chamber, now in a relatively clear condition, drains from the outlet often into what is known as a drainage field. A piping network, often laid in stone-filled trenches, distributes the wastewater throughout the field. The pipes have multiple drainage holes to be distributed throughout a drainage field proportional to the volume of wastewater generated. Prior to installing a septic tank system, tests are required on a drain field to ensure the porosity of the soil is adequate. The soil traps and eliminates any remaining impurities in the wastewater, allowing it to evaporate and/or be soaked up by plants. Not all waste in your septic tank will decompose through “anaerobic digestion”. Faecal sludge will accumulate over time that will eventually need to be emptied. The last thing desired is to have wastewater with faecal matter discharged onto a drainage field. This will cause contamination, can clog your leach field piping and/or decrease soil porosity which can be costly to fix. Some septic tank systems will need emptying every few years, while others can go 10 to 20 years without needing to be emptied. This of course also depends upon the size of households, septic tanks receiving waste from larger families will require more frequent pumping than a couple. 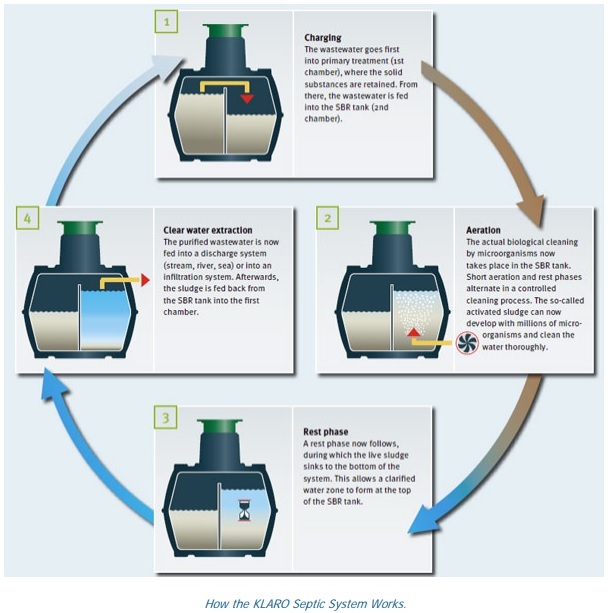 Team Poly supply the high-quality KLARO Septic System by GRAF which are certified to Australian Standards for septic tanks. Get a septic tank system that is TÜF safety-tested, AS1546.1 and ISO9001 certified, easy to clean and maintain and comes with a 15-year warranty. Talk to us today.